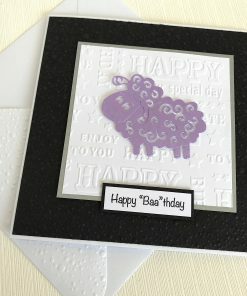 This beautiful handmade card makes a very stylish birthday card for a special Grandma. A delicate paper rose is entwined with wired beads. This is laid on lace ribbon which is mounted onto a white card that has an embossed background. Above the wording is a satin bow which is available in several colours. 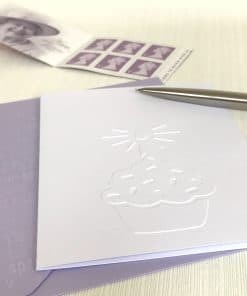 A silver envelope is included which is embossed on the flap for that extra finishing touch. This card comes with the wording “Happy Birthday Grandma” on the front. If you would like a personalised message then enter the details before adding to your basket.